For as little as $45 we can provide a limb for someone that will dramatically change their life--and we have the technology to do it responsibly. The Million Waves Project, a 501C(3), launched Earth Day, takes reclaimed ocean plastic and uses it to 3D print custom prosthetic limbs for kids. 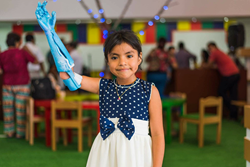 With its innovative solution to ocean pollution and the problem of limited access to affordable upper limb prosthetics, the Million Waves Project 3D prints limbs for free for kids across the globe. By 2050 it is said there will be more plastic in the ocean than fish. Additionally, approximately 40 million people in the developing world are in need of prosthetic limbs and have no access. In a 2AM ah-ha moment, founder Chris Moriarity was struck with the idea of reusing the millions of tons of ocean plastic for good. So at 2AM the Million Waves Project was born. Within a week the 501c(3) was established and partnerships were forming. The first partner, GreenBatch, a non-profit in Western Australia will be a primary source of recycled ocean plastic filament to build the 3D prosthesis. Another strategic partnership, 3DUniverse, is providing the scaled implementation of the Million Waves Project’s long-term strategy; beginning with connecting funds raised by the Million Waves project to people needing limb-making parts. Finally, the e-Nable community that is providing the open source 3D prosthetic templates and general support for the project. To join the mission, go to millionwavesproject.com.